For a smart casual getup, go for a beige coat and grey dress pants — these items fit perfectly together. Choose a pair of white leather low top sneakers to make the getup more current. For a knockout-meets-stylish ensemble, opt for a grey coat and grey wool dress pants — these pieces go really well together. Break up your look with more casual shoes, like this pair of white leather low top sneakers. This pairing of a white silk long sleeve blouse and black chinos is an interesting balance between comfy and absolutely chic. For a more relaxed take, rock a pair of Gucci ace embroidered leather collapsible heel sneakers from NET-A-PORTER.COM. 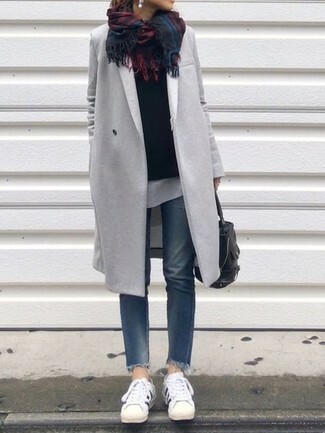 If you don't like getting too predictable with your ensembles, try teaming a grey coat with blue jeans. 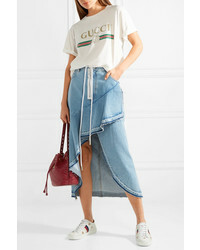 For something more on the daring side to complete this ensemble, throw in a pair of Gucci ace embroidered leather collapsible heel sneakers from NET-A-PORTER.COM. If you're scouting for a casual yet chic look, rock an olive anorak with black skinny jeans. Both items are totally comfy and will look fabulous paired together. Gucci ace embroidered leather collapsible heel sneakers complement this look very well. Go for a dark green casual dress to create a great weekend-ready look. Complete this look with Gucci ace embroidered leather collapsible heel sneakers. 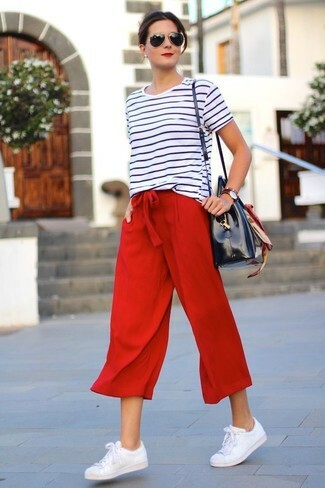 If you're all about feeling relaxed when it comes to picking out an outfit, this combination of a white and black horizontal striped crew-neck t-shirt and red culottes is what you need. 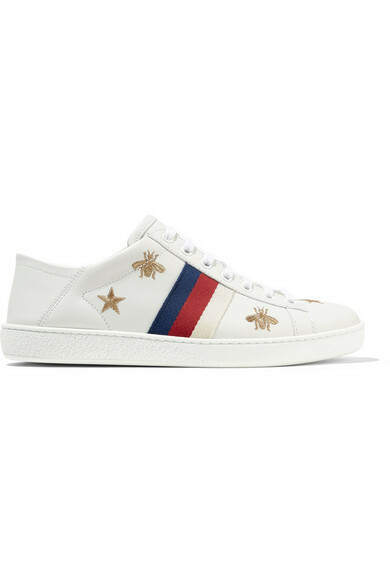 When it comes to footwear, this look is finished off nicely with Gucci ace embroidered leather collapsible heel sneakers from NET-A-PORTER.COM. If you're searching for a casual yet totally stylish getup, consider wearing a pink crew-neck sweater and a silver pleated midi skirt. Both garments are totally comfy and will look fabulous paired together. For something more on the daring side to round off this ensemble, choose a pair of Gucci ace embroidered leather collapsible heel sneakers. If you're on the hunt for a casual yet totally stylish look, go for a brown plaid coat and blue boyfriend jeans. Both pieces are totally comfy and will look fabulous paired together. To bring out a sassier side of you, round off your outfit with white leather low top sneakers.